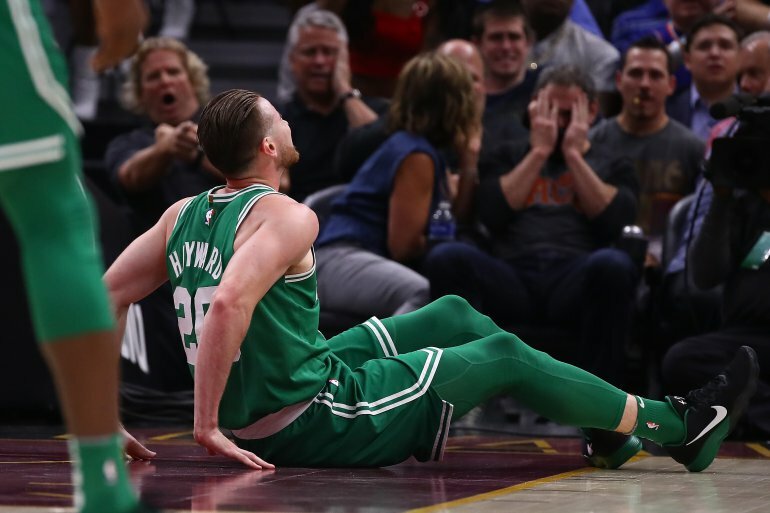 CLEVELAND — Boston star forward Gordon Hayward suffered a gruesome injury, dislocating his left ankle and fracturing his left tibia just five minutes into his debut with the Celtics. Hayward, who signed a four-year, $128 million free agent contract this summer, went up for an alley-oop pass and collided with LeBron James midway through the first quarter. He got his leg twisted underneath him as he came back to the floor. Hayward collapsed under the basket and looked in horror as his left foot was pointing outward. He put his hands to his face and dropped back to the floor as a hush fell over the sellout crowd inside Quicken Loans Arena. With minutes to play and his team still trying to claw its way back, Hayward was loaded back onto a stretcher and carted out a side door. He will return to Boston for further tests, but team officials are cautiously optimistic. 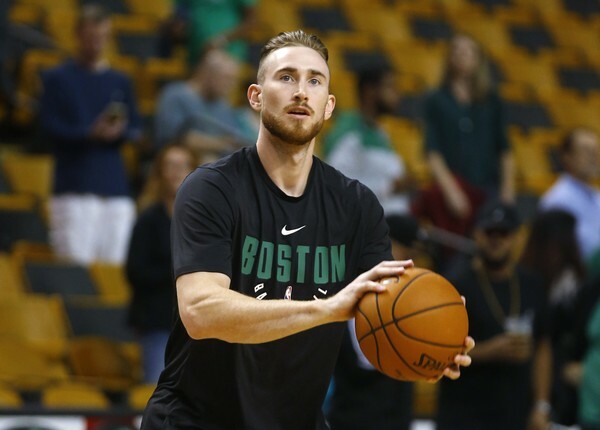 It appeared to be a clean break, sources told Yahoo Sports, and while more tests will be needed to determine the extent of the damage, Hayward may have avoided something catastrophic. After the injury, Hayward’s new teammates huddled in prayer at their bench as a distressed James covered his mouth and several Cleveland players nearby looked away. 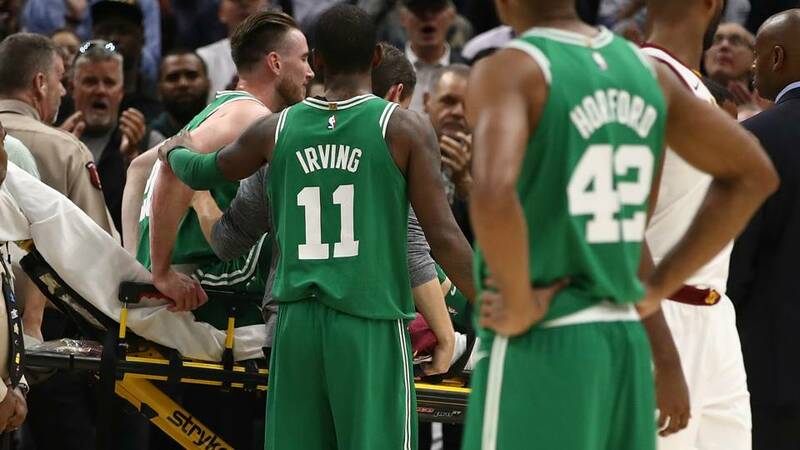 Hayward had his leg placed in an air cast, and James came over and consoled him before the 27-year-old was pushed from the floor on a stretcher. Cleveland’s crowd gave Hayward a roaring ovation as he left. The team later confirmed that Hawyard’s ankle was broken and that he’d fly back to Boston Tuesday night. It’s a devastating blow for the Celtics, who had hoped to close the gap on the Cavs in the Eastern Conference. Now, they could be without Hayward for an extended period. Hayward spent the past six seasons with the Utah Jazz before signing with Boston. The injury overshadowed Kyrie Irving’s return to Cleveland after the All-Star point guard was traded to Boston this summer. LeBron James said seeing Hayward get hurt reminded him of grisly injuries to Paul George, Shaun Livingston and Louisville’s Kevin Ware.